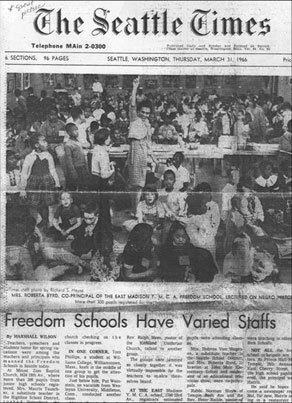 On Thursday March 31 and Friday April 1, 1966, thousands of Seattle Public School students boycotted schools in the Central District, Seattle Washington’s African American community, to protest the de facto segregation that they believed was racially discriminatory. The students and their leaders felt that most of the educational deficiencies among the bulk of Seattle’s 9,300 African American students stemmed from their attending thirteen substandard schools that were overwhelmingly and in some cases exclusively African American. All of these schools were under funded, staffed with less experienced teachers, and had lower test scores and graduation rates. The boycott followed years of attempts by African American leaders to persuade the Seattle School District to address these inequities. They had submitted a number of proposals including a comprehensive “Triad” program that would insure that black and white students schooled together; a request that the board publish a comprehensive plan to address segregation and implement in-service training for school personnel. Their proposals also included a four point program that would have closed some schools, established an integrated education center in the Central District and a Head Start program, and paid transportation costs for a voluntary desegregation program that the Seattle School Board initiated the previous year. The School Board turned a deaf ear to their requests, so the Seattle chapters of the NAACP and CORE, and the Central Area Committee for Civil Rights, organized a boycott. On Thursday and Friday approximately 3,000 students, including about 1,000 white and Asian American students, boycotted their regular classes to attend eight Freedom Schools that had been set up in churches and community buildings throughout the Central District. There students in integrated settings took courses on African American history and civil rights taught by volunteer teachers including many college students on spring break. Three public school teachers also instructed students during the boycott. The surprising support for the boycott forced the Seattle School Board to eventually implement most of the programs requested by boycott leaders. http://depts.washington.edu/civilr/school_boycott.htm ; Quintard Taylor, The Forging of a Black Community: A History of Seattle's Central District, 1870 through the Civil Rights Era (Seattle: University of Washington Press, 1994). ; Quintard Taylor, The Forging of a Black Community: A History of Seattle’s Central District, 1870 through the Civil Rights Era (Seattle: University of Washington Press, 1994).